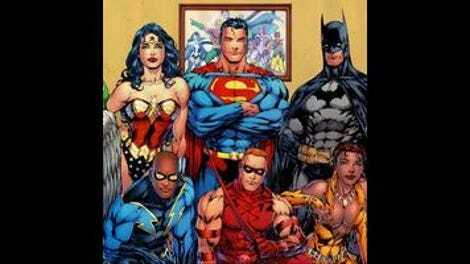 “Legends” was my first episode of Justice League. It was a Saturday afternoon and I was in my parents’ bedroom, watching their television while my sister did her hair in their bathroom. I had just started buying David Goyer & Geoff Johns’ JSA with #39, a Power Girl spotlight issue with early Patrick Gleason art, and was just starting to become familiar with the Golden Age iterations of heroes like Flash and Green Lantern. And there they were on screen, albeit with slightly altered names like Streak and Green Guardsman, proclaiming the values of heroism and honor while fighting campy villains that drove clarinet cars and shot explosive badminton birdies. As I watched a bus full of nuns nearly crash into a truck of TNT, I knew this was a show I needed to be watching. Almost ten years later, my parents don’t have that house and Justice League is a weekly commitment. It’s appropriate that “Legends” is an episode about nostalgia, because it’s easy to remember that Saturday afternoon and wish to go back, to travel to a simpler time before bills and work and growing up. It’s what Ray Thompson wanted when his world was destroyed by nuclear war and he used his mind to recreate his childhood home and heroes. Ray escapes into the past rather than facing the future, and it’s up to the Justice League to put an end to his Pleasantville-like illusions and help a broken society rebuild. While battling a giant robot piloted by Lex Luthor, Batman and Superman cause an explosion that transports Flash, J’onn, Green Lantern, and Hawkgirl to Seaboard City, the alternate dimension home of the Justice Guild. Stand-ins for DC’s Justice Society, Green Guardsman, Catman, Black Siren, Tom Turbine, and the Streak were the characters in John Stewart’s favorite childhood comic book, the people that taught him what it means to be a hero. The Justice Guild exists in an alternate dimension that the creators of the comic book had a subconscious psychic link to; what they thought was their imagination was actually the true story of a different universe. When that world was ravaged by war, the connection was cut off and the comic book ended, but the story lived on in Ray Thompson’s mind. In a way, Ray represents a faction of comic book fandom that is obsessed with holding on to the past rather than exploring the possibilities of the future. He’s the fan that exploded with rage when DC announced their plans to relaunch their entire line, the reader that refuses to buy Amazing Spider-Man because of “Brand New Day,” even though Dan Slott is telling one of most exhilarating superhero stories on the stands. That animosity comes from years of being burned by bold new directions, and eventually classic becomes comfort. Andrew Kreisberg’s script is a tribute to the Golden Age JSA/JLA team-ups originated by Gardner Fox (the episode is dedicated to his memory), and while DC refused to allow the use of the Justice Society characters, the story doesn’t suffer for their replacements. 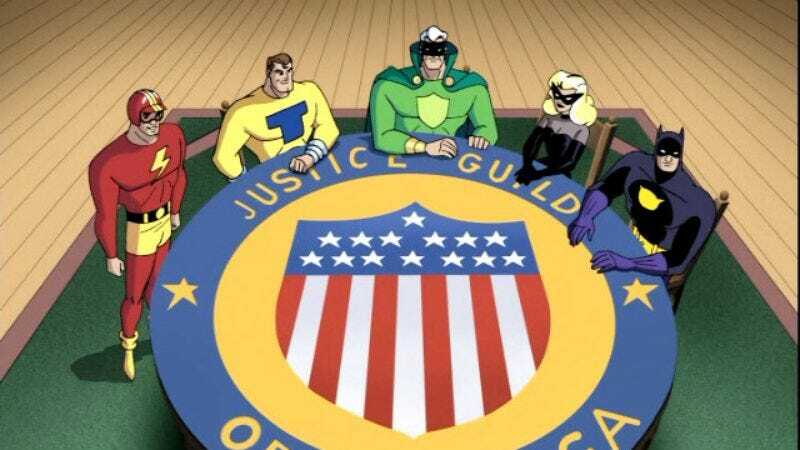 First off, the Justice Guild is a great name that immediately evokes the time period, and by using substitutes for Black Canary and Wildcat, it makes it possible to use those characters later without continuity concerns or confusion regarding their deaths at the end of this episode. Any Justice Society fan will know who is supposed to be who, and by changing the identities, the characters become analogous of an entire era of comic book superheroes. Kreisberg mines the setting for great comedy by exploiting gender and race inequality in the past, which is a lot funnier than it sounds. Black Siren urging Hawkgirl to help out in the kitchen is a running joke, and Streak’s casual racism is a reminder to John of just how different the Justice Guild’s time was. The retro dialogue is performed with the vocal flair of radio actors, and the Justice Guild cast plays up the camp and hits the puns hard, creating an even stronger contrast between the two teams. Dan Riba is the ideal director for this episode, and he creates a Seaboard City with a bright personality and full of colorful characters. He also turns in one of his best action sequences this episode: Catman’s motorcycle takedown of the Injustice Guild’s blimp. After riding his motorcycle through a building, Catman flies of the roof to the top of the blimp, then swings down and kicks the crap out of the bad guys. Batman would be proud. Catman is also voiced by Stephen Root, which makes him even cooler. In the commentary for this episode, Bruce Timm says, “It’s not even specifically about the Justice Society, it’s really contrasting the way we remember the world and the way the world is.” It’s a topic that was addressed in a similar yet completely different way by another great work of fiction this year, Ed Brubaker and Sean Philips’ Criminal: Last of the Innocent. By aping the style of classic children’s comics, the creators focused on how nostalgia distorts an individual’s perception of the past, and “Legends” does the same in the context of superheroes instead of crime. In his efforts to hold on to the past, Ray holds an entire civilization prisoner, and the only way to free a world is for the Justice Guild to make the ultimate sacrifice…again. Before charging into battle against a horrifically mutated Ray, Streak declares, “We died once to save this city, we can do it again.” “Legends” is the second episode to spotlight John, and like “In Blackest Night,” the story focuses on John’s connection to his ordinary past and how it has informed his extraordinary present. The comic books that John Stewart read as child taught him how to be a hero as an adult, and the Justice Guild’s sacrifice at the end of the episode reminds John of what his ultimate duty is if he’s ever going to uphold their legacy. To truly be a hero, he needs to be ready to die at any time, and it’s a realization that scares him. The episode ends on a somber note, a quiet moment between John and Shayera as they stare out into space, unaware of what the future may hold. Green Guardsman’s ring has no power over aluminum, is that better or worse than wood? “Legends” continues to build the Hawkgirl/Green Lantern relationship, and while I love the Batman/Wonder Woman combo because it tickles my fanboy buttons, John and Shayera definitely have the more organic storyline, and the writers wisely emphasize it. The 1960’s TV Batman flourishes in Catman’s musical scoring are a really clever way to incorporate another classic superhero era into the episode, even if was after the Justice Society’s time. Completely unrelated to anything: I played Arkham Asylum and Arkham City over the holiday break and was stunned at how awesome it was not only as a game, but as a Batman story. Is there any interest in seeing a T.V. Club style look at the games in the break between the end of Justice League’s first season and B:TAS’ second season? It’s the last DC relaunch rundown, and it’s come at the perfect time. Most books have settled into a comfortable place as they near the conclusion of their first arcs, and I can happily say that I have no intention of dropping the books that I’ve started picking up regularly. Creative teams continue to change – Gail Simone is leaving Firestorm and Paul Cornell is off Stormwatch – but the line’s strongest books remain consistent. The universe is becoming more connected, and while it creates a more immersive reading experience, it also brings crossovers and event comics, which can bring down even the best books. This month sees the first official crossover between two titles, O.M.A.C. and Frankenstein: Agent of S.H.A.D.E., which are luckily two of the strongest books of the relaunch, but there’s much more on the horizon. The Daemonite story is extending past the Wildstorm books and into the other DCU titles like Superman and Blackhawks, which worries me because every Wildstorm event I can think of is has been unsatisfying. There’s still no news as to what DC’s summer plans are, but they’re going to want to have something to compete with Marvel’s Avengers Vs. X-Men event. Right now it looks like that might be the “Watchmen 2” project, but we could very well be facing an extensive relaunch crossover soon. In terms of new books, last months The Ray #1 was one of the best first issues of the relaunch. Justin Gray and Jimmy Palmiotti have been an incredibly consistent writing team for years now, and as great as The Ray is, their work on All-Star Western is their strongest yet. Thanks to a new setting, new format, and new artist, Moritat, the duo is telling a Jonah Hex story that is connected to DC history but not shackled to it, partnering the disfigured bounty hunter with Amadeus Arkham in a Sherlock Holmes/Dr. Watson dynamic with an urban western twist. There’s no other book like it, and the added back-ups featuring art by talents like Jordi Bernet and Phil Winslade more than justify the $3.99 price tag. Gray and Palmiotti have been able to keep Jonah Hex going for years now, and by bringing the character to Gotham City they’ve opened up a wealth of storytelling opportunities, while the back-up stories provide pulp tales with the other DC western characters. 2012 is going to be one of the most important years in DC Comics’ history, the true test of whether their relaunch experiment was a success or failure. It’s most likely that not all the books will make it to next year, and it will be interesting what titles make it past issue 12. The relaunch turned rising talents like Jeff Lemire and Scott Snyder into bonafide comic book superstars, revealed the surprisingly strong writing talents of artists like Francis Manapul and J.H. Williams, and rejuvenated an entire line of characters. For the first time in years, the DC universe is an exciting, unpredictable place, and hopefully the company continues to pave new ground rather than falling back on tradition.